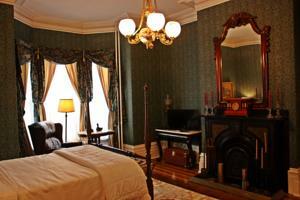 Apothic Inn is a luxury Bed & Breakfast in a fully restored 1870 Victorian Home. Three well-appointed rooms, all with private bathrooms - two ensuite. Large comfortable common areas inside and out for relaxing and unwinding. Full breakfast included. Ideal for special events and retreats. Five minute walk to downtown shops and restaurants. Visitor review: "Best stay during my trip in Canada. If you weren't planning to stop through Amherst during your travel in Nova Scotia, you should reconsider and book a stay at the Apothic Inn! Rhonda is a wonderful hostess and you will thoroughly enjoy the quiet and relaxing space she has created with charming Victorian decor. 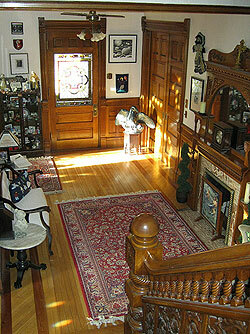 The inn is just a few minute's walk from Amherst's historic downtown. We had a nice dinner at Bella's and then a drink at Duncan's -- the local pub with live mic night on Thursday nights. You will LOVE the gourmet breakfasts Rhonda prepares! We had a terrific breakfast: delicious coffee/tea, fresh fruit, waffles and eggs Benedict. Highly recommend." - Tripadvisor review by jlafors of Santiago, Chile. October 2017. The Regent Bed & Breakfast is located in charming and historic Amherst amidst other heritage homes on famous Victoria Street. Masterfully built by Rhodes Currie Co. in 1898, this spectacular Georgian house has long been admired in the area. Its exquisite and ornate wood trim, five fireplaces and 26 stained and leaded glass windows (all original) are particularly stunning. Owners Jim and Gwen Kerr have created an elegant sanctuary and romantic retreat for people looking to take a short break from the demands of family life, get away from work stress, or have an adventure exploring this captivating area of Nova Scotia. Each room has been carefully furnished with period items that reflect the spirit and heritage of this great home and is ornately finished with an extraordinary private collection of Inuit art throughout the house. The Regent is much more than just a place to stay overnight. The rich room appointments, incredibly comfortable Simmons mattresses, ensuite baths, complete privacy and security and ideal location will make The Regent one of the highlights of any holiday or weekend retreat. Brown’s Guest Home Bed & Breakfast is a quiet, restored 100 year-old Victorian home that has served travelers for over 60 years. 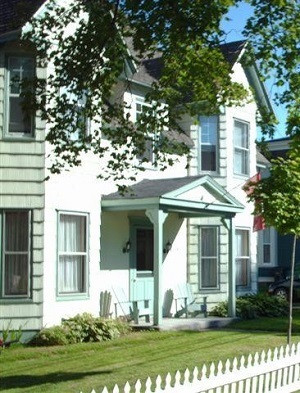 Stroll downtown and enjoy Amherst’s Victorian architecture and heritage homes. Accommodations include three rooms with two shared baths. Other amenities include a lounge with a television, Wi-Fi, as well as a complimentary healthy light breakfast. Visitor review: "Welcoming, Homely, and Excellent Value We couldn't've enjoyed a warmer introduction to Nova Scotia than the one we had from Nancy as we arrived at Brown's Guest Home. She really made us feel welcome in her home. Before we'd even asked she furnished us with a leaflet of local restaurants. We chose one she had recommended, which was excellent. The room was comfortable and traditionally furnished. There's also a whole tourist information room, with leaflets, brochures, and maps of all attractions in the local area, which was a real unexpected bonus. Breakfast was abundant with homemade items, starting with a fruit salad and including cakes, pastries, raisin toast, and delicious cranberry marmalade. - Tripadvisor review by SnazzyOwlet of Leeds. July 2011.